Okay, so I have a kitty now and he's just the best thing ever... I love him to bits and we spoil him with snuggles and toys all the time. He's living a great life since we adopted him! BUT... recently he's made a friend. One night I saw him at the window (We have windows that go almost down to the floor) and he seemed to be looking at his reflection. As I walked past him, I noticed his "reflection" had a funny white mark between its eyes... and that Pounce has no such mark. He's also orange, and the only thing I could see in his "reflection" were this white mark and his eyes. Well, that was kind of cute, so I didn't worry too much. However I've seen him a couple of times, usually while Pounce and I are in the living room, maybe watching a movie and cuddling or playing with his toys. This doppelganger (as MDVegan has named him) will sneak up and just sit, watching us. He (or she?) is pretty skittish and will run away if I go to the window or open the door. The other night I saw him/her/it at the window. When Pounce went to his scratching post (which is by the window) without noticing the cat, the doppelganger POUNCED at my WINDOW and scared the bajeezus out of Pouncival and I!!! Then it hissed at Pounce and ran away. He came back last night and was content to sit and watch us, but Pounce stood far away from the window after that "attack" the other night. It's kind of freaking me out. There's nothing on the porch he could want, he just sits and stares. I don't know if he belongs to anyone or if he's one of the strays that hangs out around the apartment complex. Oh, and we're not even on the first floor, so he goes out of his way to come up the steps and see us. I feel bad for him but I can't get close enough to even see if he has a collar. Just a black cat with a funny white mark who stares at us like he's upset that he doesn't have a family like Pounce does. I'd close the blinds and see if doppelganger loses interest. Or the curtains. If Pounce was rescued, could the doppelganger be a lost littermate? No wonder he's upset..."Man, you're in Fat City and I'm stuck out here!!" I have a doppelganger who we think is a half-brother of my cat (her mother was a stray who's had multiple litters). Our twins don't seem to interact, though. Closing the curtains may not be in the other cat's best interests - have you checked him for a collar, asked the neighbours, seen him sitting in someone's window? If he turns out to be a stray, he'd probably be happier with a shelter or a laundry room or something. We once had a kitty who had kitties (waited too long to get her spayed... we didn't know they could get pregnant as early as 6 months!!) - 2 girls and a boy, and all our cats were outdoor/indoor at the time. We never really tried to figure out who the daddy was, but we had some ideas... and then one time I saw one of the kitties interacting with some cat in our driveway... I went outside to inspect, and he looked eerily like the boy kitty (they both were pretty funky looking cats). It's nice that he got monitored visits with his kids. Maybe your doppelganger visitor wants in? Is lonely for other cats? It wouldn't be likely s/he's in heat/looking for a cat in heat if your cat is already neutered. Pounce is neutered, and I doubt this Doppelganger is related, although anything is possible. My kitty was rescued from a shoebox at the front door of PetSmart when he was just a baby kitten (over a year ago), and the PetSmart is a couple of miles away. There are houses near the apartment complex, and I've noticed other "stray-like" cats hanging out near the laundry room before, since you mention laundry rooms. Not sure if this doppelganger was one of them. He seems very people-shy. He is freaked out by me, but really seems interested in Pouncival. He's been coming around for a few weeks now, always at night. Not every night, but several times spread out over a few weeks. We've only had Pounce for about 2 months, and I never saw him before then. I'll keep an eye out for him and try to check on his collar status. Maybe I'll get a flashlight and keep it by the couch. I'm sure the local animal control would give you a humane trap to at least get him neutered (if he's not) and possibly vaccinated and tested for FIV/FeLV. A lot of cities have little or no cost spay/neuter for ferals. You could also look for a local Alley Cat Allies chapter. Good night, Doppelganger. Sweet dreams. That's a better scenario than this. I was trying to think of something witty, but you get one of Spider-Man's enemies instead. I have a story about feline visitors. HOWEVER. There was another cat who came to the window sometimes that would, for seemingly no reason, cause Bucky (the normally stupid and wussiest cat ever) to puff up his tail and arch his back and make motorcycle-like sounds. If the window was open, he'd try to claw the other cat through the screen. We ended up calling this one Enemy Cat, and whenever Bucky growled at the window we'd look out there going "is Enemy Cat there?!" Which he wasn't, alot of the time. Bucky was also the cat who chased his own tail 24/7. I would hear random snarling from my room, think the cats were fighting, go out to the hall to see what was up, and find Bucky there all alone with his tail in his mouth - he'd pin it down, then grab it and bite it, but it hurt, so he'd make weird fighting cat noises. It was hilarious. Then there was the time that Stella randomly beelined it for the toilet, literally right after I'd stood up from peeing, and I caught her in mid-air...those were some crazy cats. That's some pretty hilarious stuff, Tino! 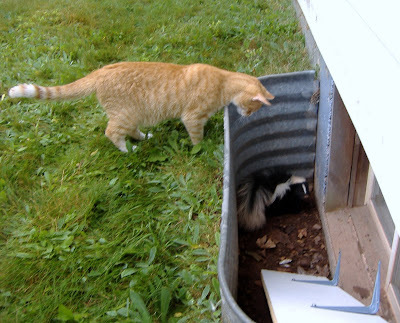 HH, funny you should post that pic, the other night I had a dream that Doppelganger was a skunk. I'm really glad he's not! I have an irrational fear of calling strange people, so I'm trying to work up the nerve to call the shelter and see about getting this kiddo some shots at the very least, if not a home. As a former SPCA shelter volunteer I can tell you that most cats like the poor kitty you know end up euthanized. If they are not super friendly and young... that is what happens. If there are any cat rescue groups in your area, I would contact them, they might be able to provide you with a trap to get him neutered and vaccinated. That is why spaying and neutering is so important. Good luck and I hope you find someone who can help you and this poor kitty! No no no no, I'm not talking about calling animal control or something. I'm talking about calling the no-kill shelter that we adopted Pouncival from. I actually had a long conversation with the two ladies who run the cat fostering program about them being a no-kill shelter. I'd leave Doppelganger to his own means on my porch before I'd call some random place that might put him to sleep instead of either get his shots and release him or take care of him until he was adopted. Of course, if NOT calling anyone will net me a visit from MDVegan... I guess I could wait a while. Let us know what happens to Doppelgaenger!